Every time I worked on a project for a Wall Street firm I got envy passing by these traders sitting in front of four monitors. 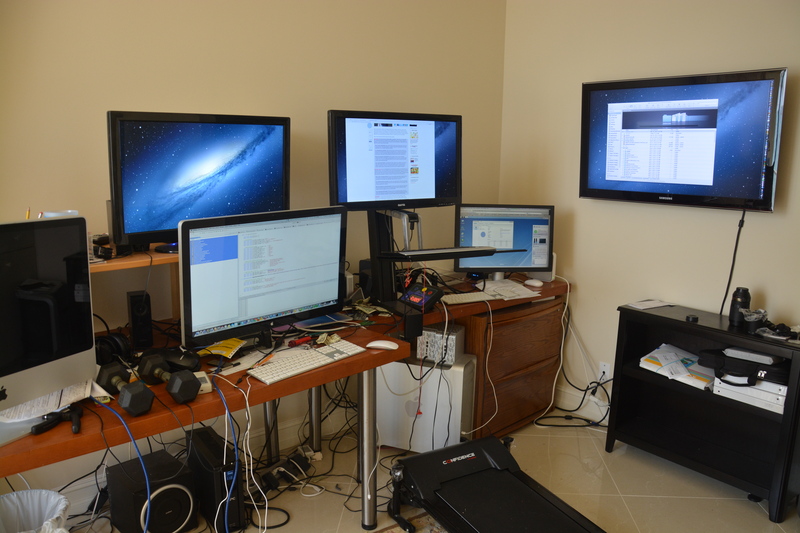 So I decided to switch to the multi-screen mode in my home office too. 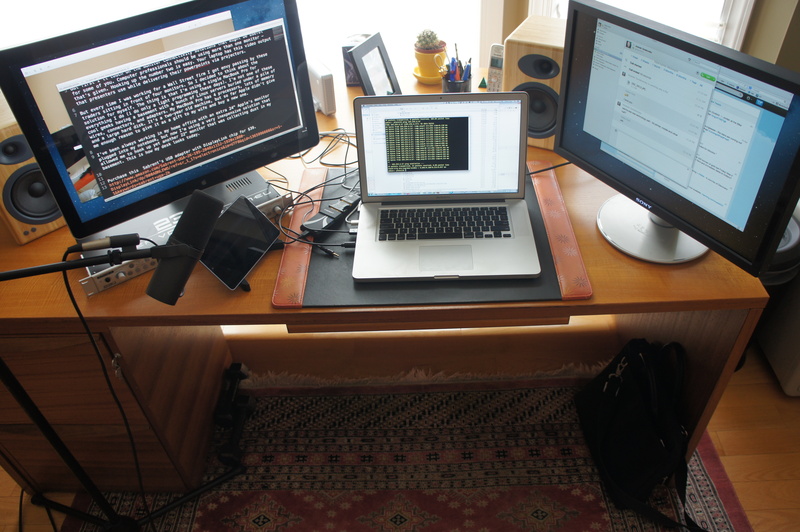 I’m using a single MacBook Pro for everything I do (I do only a light programming these days). I’m not one of these geeks having a basement with a bunch of Linux servers buried under a pile of wires, connectors, and adapters. My MacBook Pro has CPU with 4 cores, lots of memory, and a large hard disk. It’s a two-year old machine, but so far Apple didn’t give me enough reason to give it as a gift to my wife and buy a new one for myself. Let me show you a setup of my colleague at Farata Systemms. He’s a team lead and heavy-hands-on developer. This is what he built in his home office. One manager told me that he hates when during the conference call a person dials in from home and the dog is barking in the back. 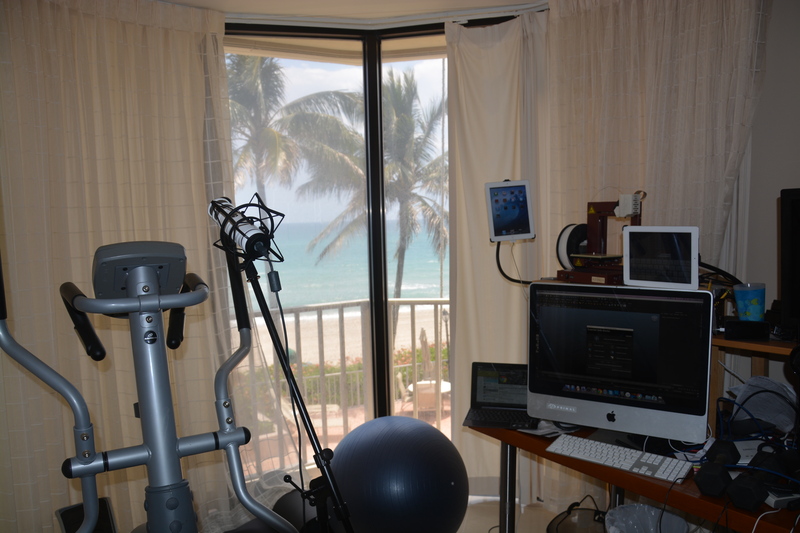 Well, when Anatole will be dialing a meeting from his home office, you might be hearing the sound of Atlantic ocean. If this will bother you, hire someone who fits nicely in the cube. This entry was posted in IT Career by Yakov Fain. Bookmark the permalink.